The start of a new year can stressful for many people. After the rush of Christmas, you often find yourself wanting a break in January. If you don’t have a holiday planned but still want to get that break, then why not book a trip to the spa? 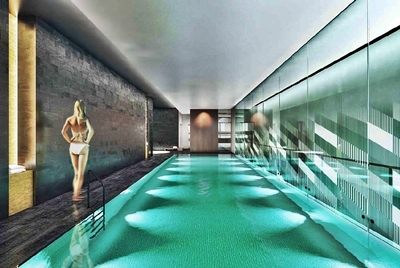 Get away from the stresses of the city at the ultimate urban sanctuary of the spa at M by Montcalm. Studded with gold leaf tiles, the pool, jacuzzi, sauna, steam room and experience showers offer blissful relaxation. Let the atmosphere take over as you get pampered by the therapists. Each experience in the spa’s three treatment rooms is exclusively crafted using the world’s most luxurious products to leave you feeling brand new. There’s a spacious gym and aerobics room too for the more energetic among us. You don’t need to feel bad about visiting the spa either. Studies conducted by Florida State University and George Mason University show that spa visits not only reduce stress and sooth sore joints and muscles, but reduce both absenteeism from work and hospitalisation. With this in mind, it’s actually recommended that you aim to visit the spa to improve your health and wellbeing. At the M by Montcalm spa, you can enjoy a range of facials, massages, body treatments and beauty services. This is perfect for a day of pampering before an event. Enjoy a facial and a massage, then get your nails and eyebrows done immaculately before you head out feeling like a million dollars. You can even make a weekend of it. Stay in one of the luxury rooms that the hotel has on offer and give yourself that break you really need to get going in 2016.